Why should I choose Five Little Monkeys for my next party rental? While there are a lot of bounce house and party rental companies in Michigan to choose from, we believe our dedication to safety, clean and high-quality inventory, and friendly and hard-working staff set us apart from other party rental businesses. By the way, we are licensed by the State of Michigan and fully insured, and our setup crews are professionally trained and certified by SIOTO (Safe Inflatable Operators Training Organization). We are equipped to handle events of all sizes - from backyard birthday parties to large fund-raising, school or corporate team-building events. In the local communities we serve, Five Little Monkeys actively seeks opportunities to contribute by way of subsidized party rentals for local events, whether held by local schools and churches or national non-profit organizations. Click here to read more about Five Little Monkeys and what sets us apart. (iv)	Safety whistles for all attendants (to help you supervise your guests). We believe safety comes before profits - always - which is why we monitor the latest news and safety recommendations from industry leaders and maintain a carefully selected inventory of safe inflatable party rentals. We have invested thousands of dollars in the latest in safe designs and safety accessories, and we strive to maintain thorough internal training policies and procedures. Why? Because that's what we would want for our own children. Absolutely, but please call us at 833-5-LITTLE (833-554-8853) or email us first to discuss what you'd like to see and arrange a time for you to visit. All of our bounce houses, water slides, tents and other party rentals are neatly stored away between rentals, but in most cases we can arrange to have a few items pulled down for you to view in person. That said, we have tons of information and pictures of our rental inventory, so if there's a particular question you have, or angle you'd like to see, we may be able to save you a trip! By the way, our warehouse is located at 12403 Stark Road in Livonia, between Plymouth and Schoolcraft. Although we're based in Livonia, we rent bounce houses, water slides, tents and all of our other party rental inventory to Birmingham, Bloomfield Hills, Bloomfield Twp, Canton, Commerce Twp, Dearborn, Dearborn Heights, Farmington, Farmington Hills, Franklin, Garden City, Huntington Woods, Inkster, Lathrup Village, Livonia, New Hudson, Northville, Novi, Oak Park, Orchard Lake, Pleasant Ridge, Plymouth, Redford, Salem, South Lyon, Southfield, Walled Lake, Wayne, West Bloomfield, Westland, Wixom, Wolverine Lake, and, upon request, several other nearby towns/cities. I found a cheap bounce house rental on Craigslist - why are your prices higher? The old adage, "if it looks too good to be true, it probably is" applies here. Many of the bounce house rental deals you'll find posted on places like Craiglist utilize older, legacy bounce houses and/or light-duty residential bounce houses, both of which lack key inflatable safety features found on our newer, commercial-grade bounce houses. Also, we are fully insured and licensed by the State of Michigan, and run by professionals who are dedicated to party rentals all day, all week, and all year, with crews that are trained and certified in the proper setup of your inflatable party rentals. And, we are available 24/7 in the event that you run into any issues during your event - to reach our Active Rental Support Department, just call us at 833-5-LITTLE (833-554-8853) and select extension 3. Is Five Little Monkeys licensed, certified and/or insured? Absolutely! We are licensed by the State of Michigan, and fully insured, for our inflatable party rentals (and our other party rentals, too!). Five Little Monkeys is a dedicated, full-time, professional operation - this is not a weekend job or side gig - it's our focus, all day, all week, and all year! HELP! My event is underway, and I'm having trouble with one of the party rentals! Don't panic! We are available 24/7 in the event that you run into any issues during your event. To reach our Active Rental Support Department, just call us at 833-5-LITTLE (833-554-8853) and select extension 3. What is your cancellation policy? Can I change my mind after booking my party rentals? Our Cancellation Policy allows for a 100% refund for cancellations made more than 30 days out, and a 100% credit toward future rentals for cancellations made as close as 7 days from your bounce house or other party rental. However, as a family-owned business, and as parents ourselves, we understand that things come up, surprises happen, and situations change when we least expect them to. While we need to stick to our Cancellation Policy to maintain competitive prices and great service for everyone, we will always try to help and understand in the event of extenuating circumstances. If something unexpected does happen, give us a call at 833-5-LITTLE, and we promise to try to help and be understanding. In the event of cancellation due to bad weather, our Cancellation Policy allows for a 100% refund for weather-related cancellations made by 7:00am on the day of the event. Click here to read the Weather Restrictions. Can you deliver my bounce house or other party rentals to me? Absolutely! We're based in Livonia, MI, but we deliver our bounce houses, inflatable slides, tents and other party rentals to Birmingham, Bloomfield Hills, Bloomfield Twp, Canton, Commerce Twp, Dearborn, Dearborn Heights, Farmington, Farmington Hills, Franklin, Garden City, Huntington Woods, Inkster, Lathrup Village, Livonia, New Hudson, Northville, Novi, Oak Park, Orchard Lake, Pleasant Ridge, Plymouth, Redford, Salem, South Lyon, Southfield, Walled Lake, Wayne, West Bloomfield, Westland, Wixom, Wolverine Lake, and several other nearby towns/cities. We also supply party rentals for larger events across Michigan - call us at 833-5-LITTLE (833-554-8853) or email us. Click here to view our Delivery Area, including delivery fees and minimum order amounts by city. What time can you drop off / set up my party rentals, and when can you pick them up? ii)	Overnight rental periods (Noon drop-off and 8am pick-up, on 1-day, 2-day or 3-day periods). Planning an event that doesn't fit any of those times/periods? Don't fret - we can adjust these rental periods for you upon request! Just give us a call at 833-5-LITTLE (833-554-8853) or email us. By the way, while we're based in Livonia, MI, we can deliver our bounce houses, inflatable slides, tents and other party rentals to Birmingham, Bloomfield Hills, Bloomfield Twp, Canton, Commerce Twp, Dearborn, Dearborn Heights, Farmington, Farmington Hills, Franklin, Garden City, Huntington Woods, Inkster, Lathrup Village, Livonia, New Hudson, Northville, Novi, Oak Park, Orchard Lake, Pleasant Ridge, Plymouth, Redford, Salem, South Lyon, Southfield, Walled Lake, Wayne, West Bloomfield, Westland, Wixom, Wolverine Lake, and several other nearby towns/cities. We also supply party rentals for larger events across Michigan - just call us at 833-5-LITTLE (833-554-8853) or email us. Can I pick up my party rental instead of having it delivered? For some items, it is possible to pick up your party rentals from Five Little Monkeys' warehouse in Livonia. Those items are: concession machine rentals (cotton candy, popcorn, snow cones) and non-inflatable games. To arrange for a pick-up rental, please give us a call at 833-5-LITTLE (833-554-8853) or email us. For safety and liability reasons, pick-up is not permitted for inflatable rentals and tent rentals. Our crew is trained in the safe setup of these party rentals, and we want to ensure that all items are safely set up and properly secured to minimize chances of injury from improper setup. Also, our inflatable party rentals are heavy-duty commercial-grade products - they are HEAVY (up to 600lbs in some cases) and bulky - safely transporting and setting these up requires heavy equipment and trained staff to avoid injury or damage to the inflatable rentals. My event is at a park or other shared/public space - can I still rent from you? Absolutely! Parks and other public or shared spaces typically require a permit. The permit application process is usually quite straightforward, depending on the location. For the most part, all you'll need from us in order to obtain your permit is an insurance certificate naming the entity responsible for that public/shared space as an "additional insured". We can obtain these certificates for you with at least a weeks' notice for a charge of $50 (pass-through of our direct cost) - just give us a call at 833-5-LITTLE (833-554-8853) or email us. Still confused about the permitting process? We've got you covered: Five Little Monkeys can manage the permit application process for you altogether, for an administrative charge of $100 (plus applicable permit fees). Again, just give us a call at 833-5-LITTLE (833-554-8853) or email us. Click here to view more information on Site Requirements. What happens if the weather is looking terrible for the day of my event? Our Cancellation Policy allows for a 100% refund for weather-related cancellations made by 7:00am on the day of the event. What items are prohibited in/on bounce houses and other inflatable party rentals? For safety and hygiene reasons, and to prevent damages to the bounce house (or other inflatable) rental, a strict Prohibited Items list is enforced. Most, if not all, of these are common sense items, but please read them carefully nonetheless, to avoid damaging your rented bounce house (or other inflatable rental) or, worse yet, causing injuries to participants/guests. Click here to read the list of Prohibited Items. What do I do if it gets windy/rainy/stormy while my tent or inflatable party rental is up? Weather conditions can change suddenly and unexpectedly. No inflatable unit or tent should be used in the event of winds or gusts over 15 mph, or thunder, lightning, hail, heavy rain, or any other inclement weather or severe weather warnings (or, for inflatables specifically, temperatures under 40 degrees Fahrenheit). 3)	Promptly call the Company at 833-5-LITTLE and choose extension 3 to speak to the Active Rental Support department. Click here to read the Inflation/Deflation Instructions. Can you set up on concrete/asphalt or indoors, or just on grass? For safety reasons, we only set up bounce houses, inflatable slides, water slides, obstacle courses, and other ride-on/ride-in inflatable party rentals on indoor and grass surfaces, which are level and free from any rocks, sticks or other hard or sharp objects. Other surfaces can present either a safety risk (slips, trips, and falls) or cause damage to the bounce house or other inflatable rentals. During the checkout process, you will be prompted to select from available setup surface options for each inflatable rental. Please note that for indoor setups of certain inflatable party rentals, there is a small additional charge (of $9-$19) given the more onerous anchoring requirements (sandbags). Click here to read the full Site Requirements. Our tent rentals can be set up on any level surface - grass, concrete/asphalt, or indoors. During the checkout process, you will be prompted to select from your setup surface for each tent rental. For concrete/asphalt surfaces of our 20x20 tents, please note that we utilize specially-desigend Giffy water barrels as anchors, which require access to a water source and hose of sufficient length to reach the setup area - given these more cumbersome anchoring requirements, an additional charge of $49 will apply. Our 10x10 and 10x20 tent rentals are commercial grade pop-ups which utilize sandbag anchors and do not require access to a water source, and there is no additional charge for setup on concrete/asphalt surfaces. If you are unsure about your setup surface, please call us at 833-5-LITTLE or email us to discuss your specific situation, ideally prior to confirming your booking online. Do you clean and sanitize your party rentals? Absolutely! Call us obsessive, but we wouldn't want to rent anything that hasn't been properly cleaned BEFORE AND AFTER EVERY USE. 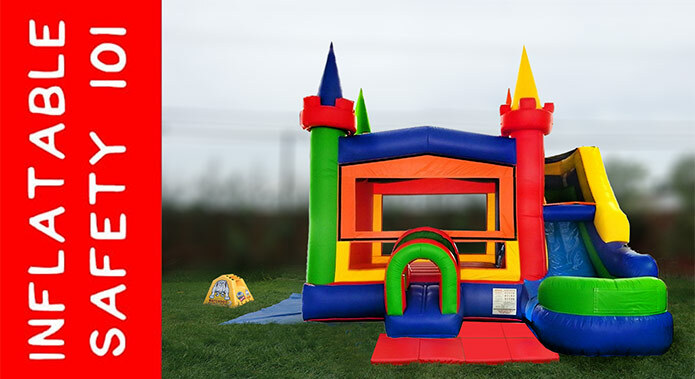 Not only are our bounce houses and other inflatable rentals spot-cleaned onsite, they are deep-cleaned in our dedicated warehouse, which is more than large enough to put up all of our inflatable party rentals indoors for a proper cleaning. We use Simple Green, which is non-toxic, environmentally friendly, and biodegradable. We also soak, disinfect and scrub all of our concession machines after every use, which is not only important from a food safety perspective, but also ensures that your guests enjoy the fluffiest possible snow cones, cotton candy and popcorn. Click here to read more about our approach to party rental Cleaning & Maintenance. Aren't all bounce houses and inflatable party rentals pretty much the same from a safety perspective? What's the big fuss about bounce house safety? Unfortunately, there is a huge safety-related disparity across bounce houses, water slides, and other inflatable rentals. For a solid overview on the key safety design features and accessories you should look for in your next bounce house rental, check out our Inflatable Safety 101 infographic at the bottom of this page. Our entire rental inventory was purchased new for the 2019 season, and our inflatable party rentals are heavy duty commercial-grade products complete with the latest in safety design features (e.g. covered slide platforms, bounce house ceiling egress ports, non-accumulating water slide pools (less than 4" water depth), and much more). Many bounce house rental companies unfortunately still carry unsafe older inflatable party rentals, which do not have these features, and some party rental companies even offer cheap, lightweight bounce house rentals which are not as thoughtfully designed from a safety perspective. (iv) safety whistles to help you supervise your guests - all free of charge! Lastly, you can rest assured that all of our bounce house and other party rentals are set up safely and properly, with at least one crewmember with SIOTO Advanced Certification present at every party rental setup. Click here to view our Inflatable Safety 101 infographic. Click here to read more about our policy of Safety Above Profits. Click here to read the Safety & Operating Instructions. What are the rules for the safe use of my bounce house or other inflatable party rental? In addition to the instructions/rules posted on the inflatable party rental itself, a full list of Safety & Operating Instructions is provided in the Rental Agreement which you will be asked to sign after confirmation of your rental booking. Most of these rules are common sense, such as disallowing rough play or other unsafe use of the unit, ensuring proper supervision is in place at all times, and listing Prohibited Items which are not allowed onto or into your bounce house, water slide, or other inflatable party rental. Do I need to supervise the use of my inflatable rental? Do you provide staff / attendants? Attendants (responsible adults) must always be present and actively supervising the use of every bounce house or other ride-in/ride-on inflatable rental. The required number of attendants is shown on the product page for each item, along with other item-specific details such as required setup area size and rider age/height minimums and maximums - it is critical that the required number of attendants are present and actively supervising the use of every inflatable at all times. Five Little Monkeys does not provide staff or attendants along with its inflatable party rentals. Our customers are asked to provide their own attendants, which can be the renter/host or a party guest (for backyard rentals) or volunteers (for corporate, school or commmunity event rentals). What is a Watchdog Series 2 Blower Siren, and what does it do? Five Little Monkeys is the first party rental company in Michigan and even Nationwide to offer these sirens to all of its customers with every bounce house, inflatable slide, obstacle course, and other ride-in/ride-on inflatable party rentals - free of charge! b) Loss of Power: Accidentally unplugging a blower or a tripped circuit breaker. The Watchdog S2 Blower Siren is designed to detect the loss of power AND, amazingly, also the loss of air in the inflatable rental unit itself, sounding a 120db alarm to ensure attendants are aware before the unit has time to substantially deflate. It's important to note that the old Watchdog Siren was only able to detect the loss of power, whereas our new Series 2 sirens feature more sophisticated circuitry, allowing for the detection of loss of air in the unit itself, whether or not caused by loss of power. Pretty neat, huh? At Five Little Monkeys, we believe safety comes before profits - always - which is why we invested thousands of dollars in these sirens and provide them free of charge with every bounce house, inflatable slide, obstacle course, and other ride-in/ride-on inflatable rentals. What does ASTM / SIOTO / CPSC / IAAPA stand for? ASTM (American Society for Testing and Materials): The ASTM is an international body that puts together steering committees focused on designing safety standards across a number of industries. With regards to inflatable rentals specifically, the ASTM has issued several papers which contain detailed safety design guidelines for manufacturers and operators. The latest of these is ASTM F2374-17, which was issued in Feb-2018. We ask all of our suppliers to confirm compliance of any inflatable rental units we purchase. SIOTO (Safe Inflatable Operators Training Organization): SIOTO is a Michigan-based safety training and certification entity which monitors the latest recommendations from ASTM, along with industry best-practices, to assemble safety courses called BISOC (Basic Inflatable Safety Operators Course) and AISOC (Advanced Inflatable Safety Operators Course). We require at least one crewmember on every party rental setup to be AISOC certified, to minimize the chances of improper (and unsafe) setup. CPSC (Consumer Product Safety Commission): The CPSC is a Federal Government commission which oversees a wide range of products offered for use by US consumers. With regards to inflatable party rentals specifically, the CPSC has issued several bulletins in past years which contain tips and warnings regarding the safe setup and use of inflatable party rentals, the latest of which was issued in Aug-2015. We incorporate the guidance from these bulletins in our internal training procedures and rental policies. IAAPA (International Association of Amusement Parks and Attractions): IAAPA is body which gathers a wide-ranging group of international amusement park and ride operators (including inflatable rides, like bounce houses). Each year, IAAPA hosts a huge expo in Orlando, FL, where operators and manufacturers from across the world gather to see the latest products and discuss the latest in safety and design features. Five Little Monkeys sends its own delegation to this IAAPA event, where our managers network with manufacturers and other operators to stay abrest of the latest and greatest in our industry.